Looking for an easy, quick and healthy autumn lunch or midweek supper? Try this luxurious, comforting and creamy One Pot Pumpkin Pasta, that can be on the table in less than 30 minutes. It is super simple, super easy and a well-balanced heartwarming meal. It's an impressive meal to make for friends and family, just grab a fork and plate and dig in! One pot meals are handy. Great for the family, they are healthy, hearty and will save you lots of time in the kitchen, especially for those who hate washing up afterwards :) With autumn now in full swing, we have been creating some comforting and delicious pasta recipes that we had to share with you. Today I bring you one-pot pumpkin pasta, and I am really proud of my daughter who prepared this at her place and gave me this recipe just a couple of weeks ago, and since then I've already made it twice. This dish is bursting with goodness, bursting with flavours and textures too. We have the main hero Pumpkin, to accompany we have spinach and to get beautiful texture and protein there are nutty chickpeas and mascarpone too. Autumn means one thing - pumpkin! 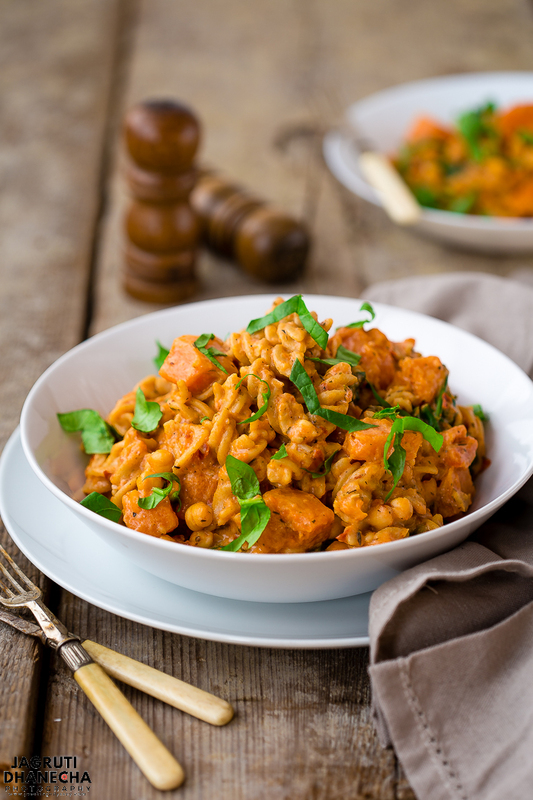 Before you indulge in sweet pumpkin recipes, whip up this One pot pumpkin pasta to enjoy autumnal flavours! You'll only need a one pot to whip up this quick and easy meal that is perfect for those chilly autumn days! Basically, you can use any type of pasta, white, whole wheat, gluten-free or lentil pasta. We have used whole wheat pasta, which is healthier than white pasta. In this recipe, any winter squash can be used such as butternut squash, Kabocha, Acorn, Ambercup or buttercup. Yes, you can turn this recipe into a vegan. Replace the mascarpone cheese with coconut cream, nutritional yeast or cashew cream. It's a simple recipe, you just need a pumpkin, which is peeled and cubed, fresh spinach, mascarpone cheese, cooked chickpeas and obviously pasta. Onion garlic is a must in pasta recipes, and vegetable stock lends more flavours. A few red chilli pepper flakes and freshly ground pepper for the heat, mixed herbs and tomato puree to create a thick sauce. First, heat some olive oil in a heavy bottom pan, and add roughly chopped onion and garlic. Fry the onion for a good couple of minutes then add pumpkin along with red chilli flakes and mixed dried herbs. Mix everything then add tomato puree, pasta and chickpeas. Add vegetable stock and cover the pot with the lid. Cook the pasta for about 10-12 minutes, check the water level. Pumpkin should not be mushy. Add the spinach and mascarpone cheese, mix everything and check the seasoning and add a little salt and freshly ground pepper. 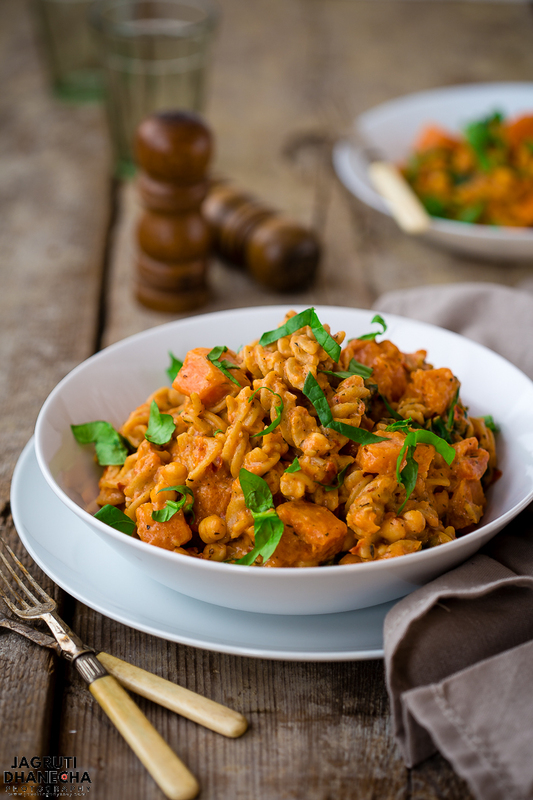 Healthy one pot pumpkin pasta recipe with spinach and chickpeas, a delicious 30-minute recipe for chilly autumn days! Heat oil in a thick bottom pan and add onion and garlic. Fry the onion mixture for a couple of minutes. Add pumpkin and cook for a minute. Add red chilli flakes and mixed dried herbs, mix well. Now add tomato puree, pasta, chickpeas and vegetable stock. Cover the pan with the lid and cook the pasta for 10-12 minutes, check in between for the water level. Once pasta is done, add fresh spinach and mascarpone cheese. Mix well, add a little salt if needed and freshly ground black pepper. Vegan, skip the mascarpone cheese, instead, use nutritional yeast or coconut or cashew cream. Instead of spinach, you can add kale too. Don't like chickpeas, try mushroom instead. Delicious pumpkin pasta.. A healthy one too. Never tasted with pumpkin before. 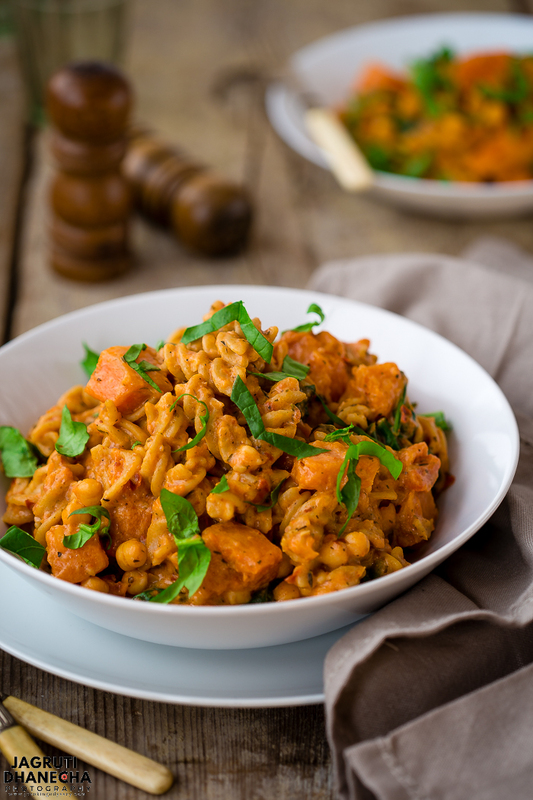 Never thought of Pumpkin Pasta before, you and your recipes always amaze me this bowlful of pumpkin 🎃 pasta is bursting with flavours love the addition of chickpeas as it will add nice texture to the whole dish making it more healthy and yummy, bookmarking it. Pumpkin season and we cannot have enough of this vegetable! Love one-pot dishes and making pasta is usually a 2 step one; making the pasta and then mixing into the sauce. Love this super easy and super delicious looking dish! This pumpkin pasta is making me drool. I have never heard about it. I love one pot meals and quick to make recipes. Lovely share. This is a perfect autumn recipe to enjoy. Pasta has turned out so colourful and bright. I must try this recipe sometime soon. Had never thought of pumpkin and pasta together. It looks delish..! Pasta looks like filled with full of flavours and delicious. Never tried adding pumpkin into pasta. Will try this version too. This is a new dish to me Jagruti..but it looks so appealing ! Would love to give it a try.. timely post as Pumpkins rule the market these days. This pumpkin pasta looks so gorgeous and comforting. A perfect meal for the fall I must say! And the step by step pictures add a lot of value to this recipe because its so easy for readers to understand. Pasta is one of my all time favourite snack. Pumpkin pasta looks so perfect and amazingly delicious recipe. YUMMY! Beautiful pictures Jagruti. I am not a pasta girl but I am going to substitute this with other grains. I love the combination here. What a unique combination, pasta with pumpkin. Sounds very interesting and delicious. Lovely clicks. Lovely pictures jagruti, love that vibrant color the pasta has got! Quick one pot meals like this are a blessing on a busy day, I bet kids would go crazy for this colorful pasta! I love pumpkin season because that means I can eat new and fun recipes like your pumpkin pasta! 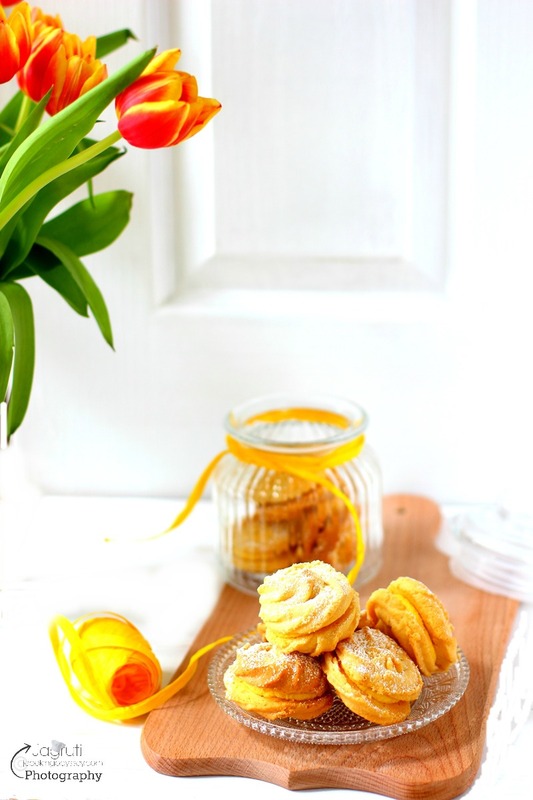 The recipe looks delicious and easy and I look forward to trying it! I looove pumpkin. I'm always looking for new pumpkin inspiration. This is a great idea. Pumpkin as a creamy, hearty pasta sauce to chase away the winter blues. Wow, wow, wow! This pasta looks as if it had just fallen from fall heaven!? The sound of pumpkin mixed with creamy mascarpone cheese, chickpeas and spinach has got me drooling and your pics are a delight to look at! I love one-pot meals, and this pasta looks perfect for fall! I also love that you can easily make it vegan. Great recipe! Absolute comfort food. Fall flavors are simply the best and pumpkin and pasta together is killer. This looks so great for fall! I love all the substitution options you've given for other types of squash to use in this recipe, too. One pot meals are such a lifesaver, especially for busy weeknights. Oh wow - pumpkin, spinach, chick peas... this looks and sounds sooo good! This is the perfect fall comfort food! Mmmm this looks so comforting! Such a perfect Autumn dinner idea...I'd love to dig right in! Your photos are so pretty! I keep saying I'm going to make a pumpkin based dinner but I keep thinking of Pumpkin Pie so my mind gets in the way. This looks worth the try. Pasta is awesome, pumpkin is awesome, together? Definitely awesome. This looks SOOO GOOD! !